Matching donations for 7hills Homeless Center are encouraged. Donations may be mailed to: 7hills Homeless Center, Attn: Donations, 1031 N. College Ave, Fayetteville, AR 72701. Secure online donations may also be made on the 7hills website: 7hillscenter.org: . About Chase Family Foundation: The Chase Family Foundation focuses on providing support and resources to improve the quality of life for our most vulnerable populations in Northwest Arkansas, including the elderly, Veterans, women and children in domestic violence situations, and animals. For more information on The Chase Family Foundation visit http://chasefamilyfoundation.com/about/ or contact Dr. Johnny Bakker at (479) 601-4800. 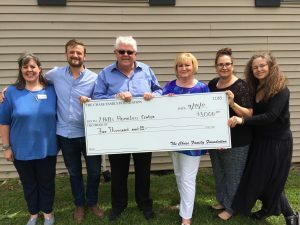 About 7hills Homeless Center: 7hills provides life-changing programs to work toward ending homelessness and poverty, including a drop-in Day Center, a transitional living facility, and supportive services for Veterans. The 7hills Day Center provides clients with essential services including meals, showers, clothing, job search assistance, and more. Last year, the Center served 17,905 meals to our clients and experienced over 24,000 drop-in visits. The Walker Family Residential Community, a supportive housing program managed by 7hills, offers affordable dormitories, apartments, and townhomes to individuals and families transitioning out of homelessness. In 2016, the Center served 216 families and individuals seeking supportive housing. 7hills Veteran Services include community-based housing and provide supportive services to low-income homeless veterans and their families. Last year, the program served 127 veteran households and placed 107 veterans and their families in permanent housing.